Angelina Jolie: There Is Nothing Like A Dame! Today, the Academy Award winning actress was made an Honorary Dame when she was presented with the insignia of an Honorary Dame Grand Cross of the Most Distinguished Order of St Michael and St George by The Queen, for services to UK foreign policy and the campaign to end war zone sexual violence. The investiture took place during a private audience at Buckingham Palace. Looking very Duchess of Cambridge-esque, Jolie wore a tailored light grey pencil skirt and wool crepe peplum jacket by Ralph & Russo couture, paired with Salvatore Ferragamo heels and looked demonstrably moved by the presentation. It is fair to say that these days the Maleficent star’s impressively successful career runs about even to her humanitarian work. 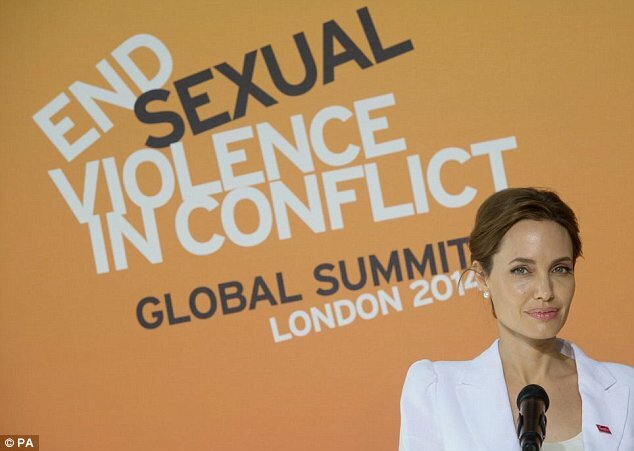 Jolie is a special envoy for the UN High Commissioner for Refugees and is a co-founder for the Preventing Sexual Violence Initiative (PSVI). 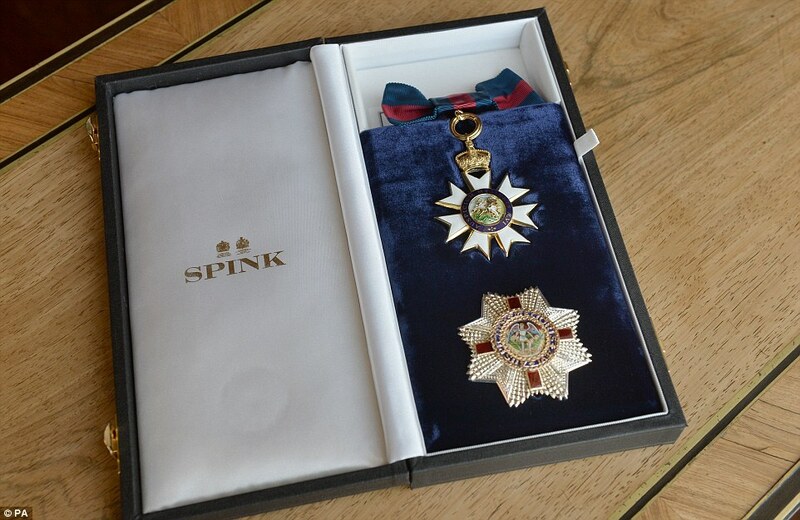 The award was first announced in June when The Queen’s Birthday Honours list was revealed. At the time Jolie was co-chairing the End Sexual Violence in Conflict (ESVC) global summit in London with then foreign secretary William Hague. Jolie said at the time: “To receive an honour related to foreign policy means a great deal to me, as it is what I wish to dedicate my working life to. After the presentation took place in the palace’s 1844 room it is said that Pitt and the couple’s six children had the opportunity to meet the Queen. Because Angelina is a foreign citizen she may not be addressed as Dame, though she can use the initials DCMG after her name. Still a most amazing honour. Lady Anglophile…wondering what one will wear to one’s own investiture! This entry was posted in Home Page Posts, Rule Britannia! and tagged Angelina Jolie, Honorary Dame, The Queen. Bookmark the permalink. 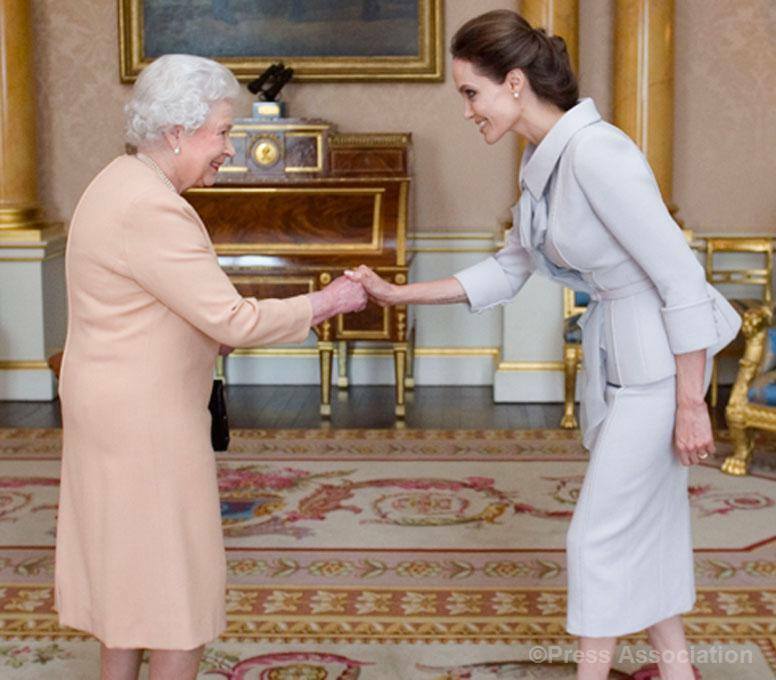 3 Responses to Angelina Jolie: There Is Nothing Like A Dame! You could say that Angelina grew up. What she thought that she’d never want, she now has and loves very much. She never saw having kids for herself naturally and adoption was the rule and then she met Brad and everything changed. Once she started adopting kids she changed from the wild child she was and into a woman that a great many people respect. It is a good thing and I think most of us wish her the best. I LOVE Angelina Jolie!! But I think she needs to get a little weight on her.. she looks too skinny. But a great honour nonetheless!! Love her, love her, love her. I think she is a true example of someone who was going down the wrong path and then she found her calling. Not only is she beautiful, but from everything I have read she is an amazing mother, wife and humanitarian. I am happy for her and I wish her all the best.